I’ll start with a topic very close to my heart: the book Specimens of Chromatic Wood Type, Borders, &c., Manufactured by Wm. H. Page & Co… This mind-blowing object, published in 1874, is something that I have much, much, much, more to talk about than I will go in to now. Instead, in the interest of time, I’ll just note a great set of greeting cards published by the RIT Cary Graphic Arts Press that feature scaled-down reproductions from the book. Also available are similar cards featuring reproductions from a great French lettering manual, Nouvel Album de Letters Peintes . You might as well check out all the cool stuff that the press sells related to printing history. It’s a great source of cheap but awesome gifts. Both sets of 4.25″ × 6″ cards are sold in packs of 8 — 2 each of 4 designs, with envelopes. I’ve purchased several batches myself over the past few years. There are tons of products available online that are printed using wood type (I’ll show some more below). The thing I personally like about this set of coasters from Marquand Books is that the type isn’t intentionally “distressed”, as is so common with many similar products. Instead, the letters are printed cleanly in solid black. I can’t say that I would ever really use my own set of hand-printed coasters; but whatever, it’s wood type! 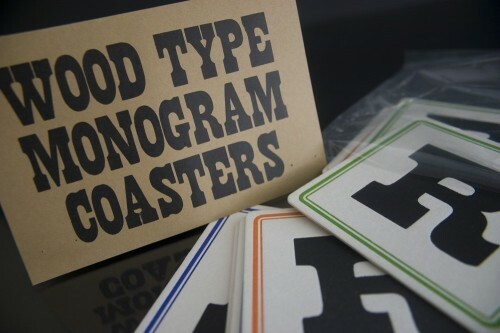 They also offer some wood type doorknob hangers, but I like the coasters much better myself. The 3.5″ square coasters come in a nice little packaged set of 9 — 3 each of 3 colors (orange, green, and blue). 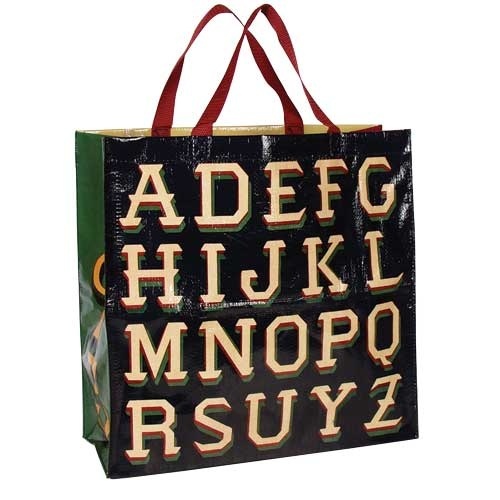 Similar to the cards show above, this bag from Blue Q reproduces alphabets from beautifully colored French chromolithograph lettering samples. Unfortunately it’s sold without any proper credit to the original source, but I think it might be from Modeles de Lettres , 1884. 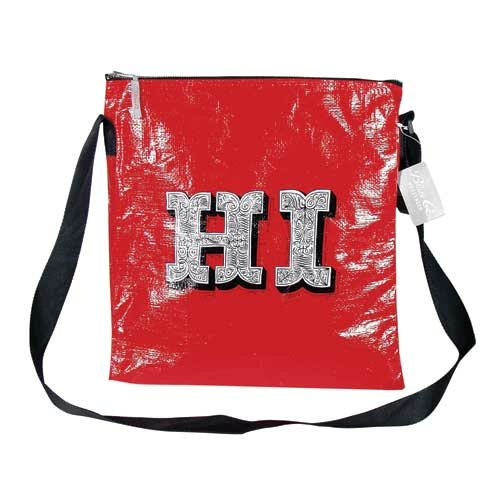 Blue Q also has the cool HI/BYE shoulder bag featuring decorative lettering by the talented Ray Fenwick. Both bags are made with recycled woven polypropylene. 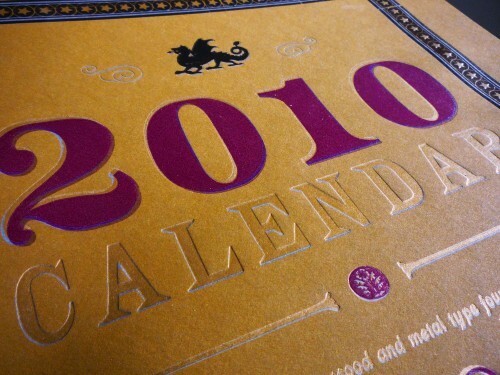 This calendar was printed by Allen Stump at his a Mano Press. 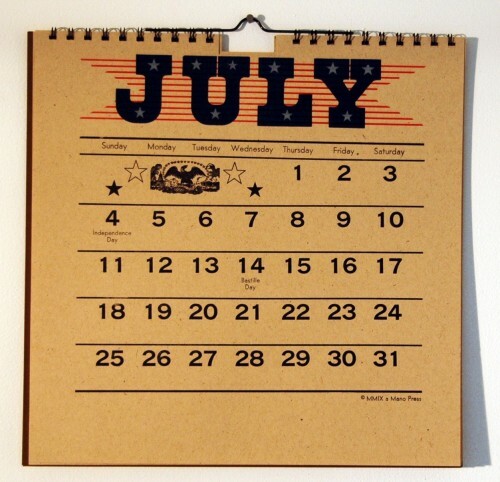 Calendars are great for end-of-year gifts, but they’re ten times better if printed with the same wood type collection I encountered on my visit with Allen over the summer. 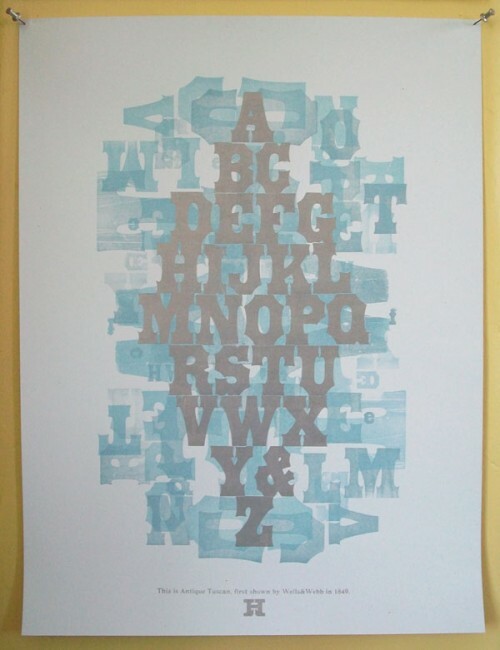 There are other worthy items from the a Mano Press available on their Etsy shop. The wirebound caledars are 12½″ square, printed in multiple colors on a pair of Vandercooks. House Industries has been doing some great stuff with the prestigious library of Photo-Lettering Inc since they acquired the materials in 2003. 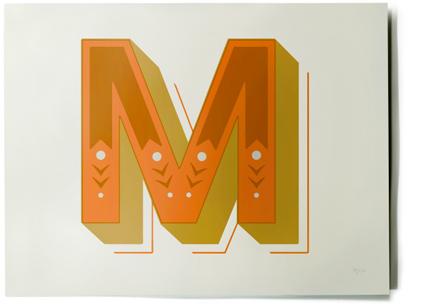 One highlight of such work is this silkscreen-printed poster featuring a chromatic glyph from PLINC’s Eventide alphabet, originally designed by Paul Carlyle, digitized by Jeremy Mickel, and printed on this poster by hand with metallic inks by David Dodde. The hand-numbered 26″ × 20″ poster is printed on 130# acid-free cover weight paper. I picked up a copy for myself when House was selling them at the TDC recently. The first alphabet of Jessica Hische’s Daily Drop Cap project that I wrote about previously has found its way on to a poster. The 15″ × 22″ poster is an archival Giclee print on Velvet Fine Art paper and comes signed by Jessica. 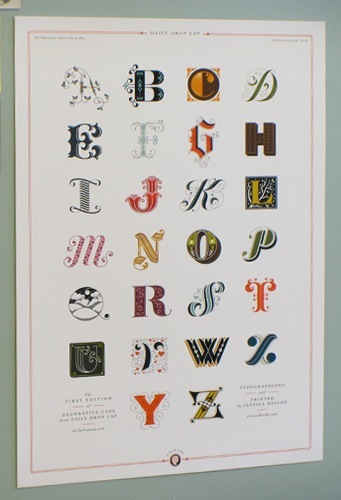 For people looking for kid-related gifts, this poster from Richard Ardagh and New North Press shows three variations of the traditional nursery rhyme, each set in a variety of 19th-century display type styles. 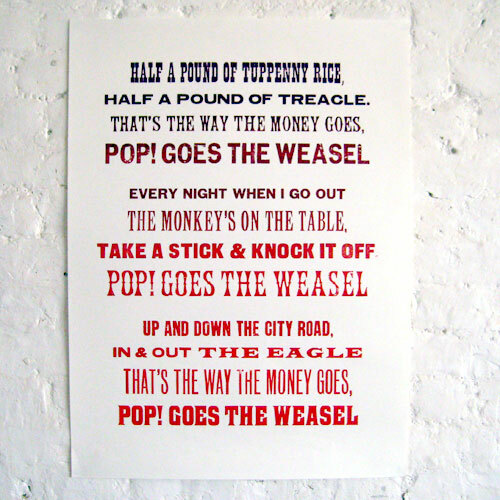 They made a video showing the process of printing the posters, accompanied with an endearingly British singsong take on the rhyme. There are a few other prints offered from the same collaboration that are worth checking out too. The 560 mm × 760 mm (≈22″ × 30″) poster was hand-set and printed in an edition of 200. 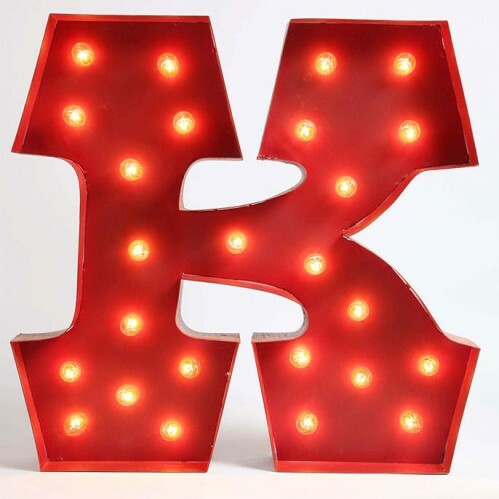 We enter a higher price bracket with these large-scale lighted marquee letters from Urban Outfitters. I promote this item somewhat begrudgingly since I’m not particularly a fan of some of the practices of Urban Outfitters. However, these letters are too cool to leave out and I couldn’t find any info about how to get them otherwise. The particular shape of serifs used for these letters designate them as being of a “mansard” style. 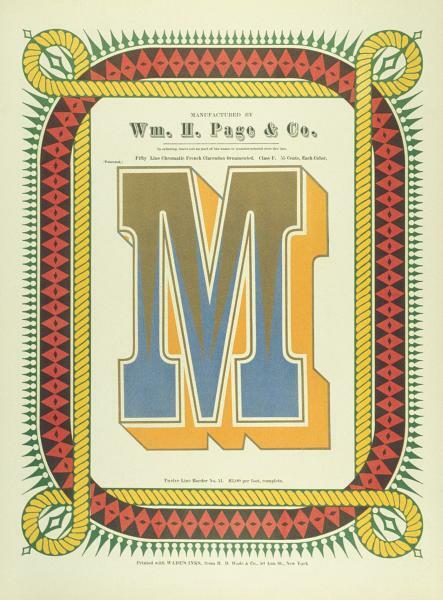 William Page patented and sold wood fonts of this style in 1879 as “№ 121”, but a thorough history requires more details than I’ll go in to here. 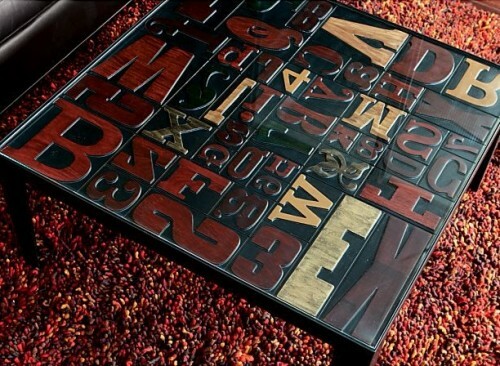 The metal letters vary in width from character to character, but are all 24″ high × 4″ deep. I don’t have any expectation that anyone will actually buy this after reading about it here, but I include it for the sake of relevance. The top of this table from Crate & Barrel is composed of wood type — or, actually, a solid piece of wood that’s been carved, painted, and finished to make it look like wood type. According to the product description, the table was designed by “a London graphic designer with a penchant for, and a large personal collection of, antique printers’ blocks”. I can’t say I know who that is, but if I don’t know them already, they sound like someone I could have a good conversation with. The table has a steel base and glass top that covers the letters; it measures 36″ wide × 36″ deep × 17″ high. 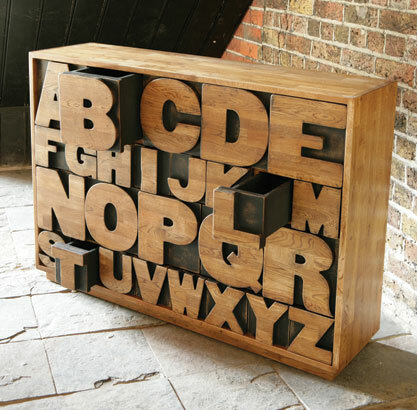 Also in the realm of things I know people will think is cool but won’t actually ever buy is this big chest of wood type inspired drawers from Kent & London. In fact, there’s a good chance you may have already seen this on design and type blogs already, but I’m including it here for its notable relevance. The letter style used on the front of each drawer approximates one offered in wood type by a huge number of manufacturers, most of them calling it, simply, “Gothic“. Similar to the “mansard” mentioned above, a whole article could be written about this style, but I’ll refrain for now. Coming back to the real world… if conspicuous consumption and material possessions aren’t your thing, you can always take the charity route and support this deserving organization on someone else’s behalf. 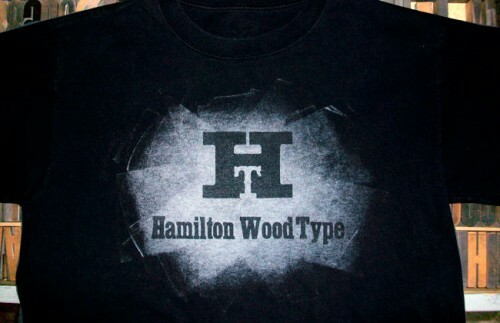 Membership to the Hamilton Wood Type & Printing Museum is available on a number of levels which include things that you can wrap and give to people if you want, like digital fonts, printed specimen sheets, books, shirts, etc. Members also get reduced studio rental cost incentives. 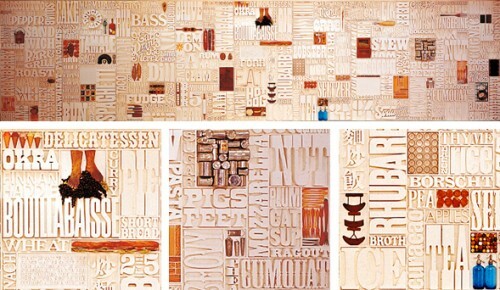 If you aren’t the membership kind of gift giver, the museum also sells a variety of other wood type products. 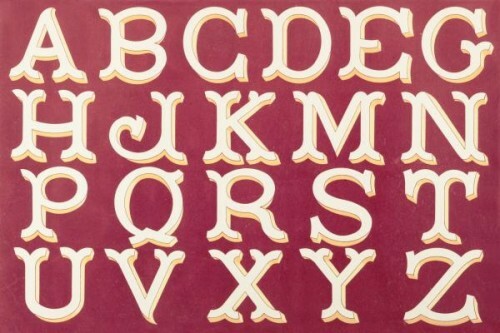 Another charity gift option is to help fund the restoration of Lou Dorfsman‘s amazing wall of lettering. I won’t go in to much detail describing it here (I’m hoping to do a related report at some point in the future), but this piece of wood type-ish design is more than worthy of the care and restoration that the Center for Design Study is working towards giving it. This short interview with Dorfsman gives a good idea about what you’d be helping to preserve. 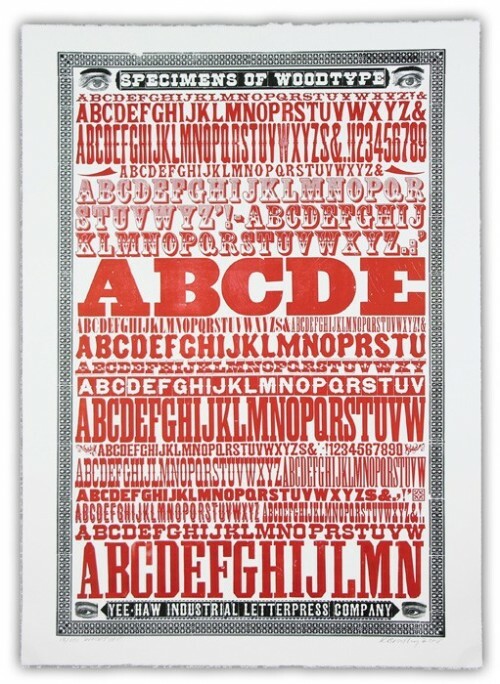 I’ll end this list of gift ideas with the items I’d like the most… This series of 3 specimen posters (1, 2, 3) was printed by Yee-Haw Industries and features a huge variety of wood type faces. I saw all 3 of the prints at Yee-Haw’s Chelea market show in October, and have been wanting them ever since. They definitely aren’t cheap, but after having printed a similar specimen poster myself over the summer, I can fully appreciate the amount of work it takes to produce something like this. These images definitely don’t do the prints proper justice, but I’ll show them all regardless. 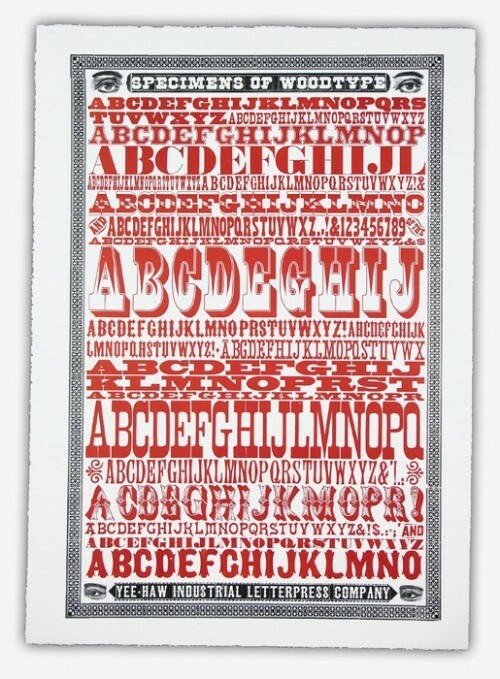 Yee-Haw has tons of other wood type stuff in their Etsy store (18 pages worth! ), so definitely check that out as well. Also, if you’re in the New York City area this month, Yee-Haw will be up from their home in Knoxville to sell stuff at a bunch of different craft fairs, flea markets, etc, including a pop-up shop at Chelsea Market (where their show is still up). Instead of repeating all the details, I’ll just direct you to their official announcement. The color posters above are printed 2-color on 30″ × 42″ archival acid-free 100% cotton paper with deckled edges. Please buy me all of them. I could keep going with more suggestions, but this list is already too long. 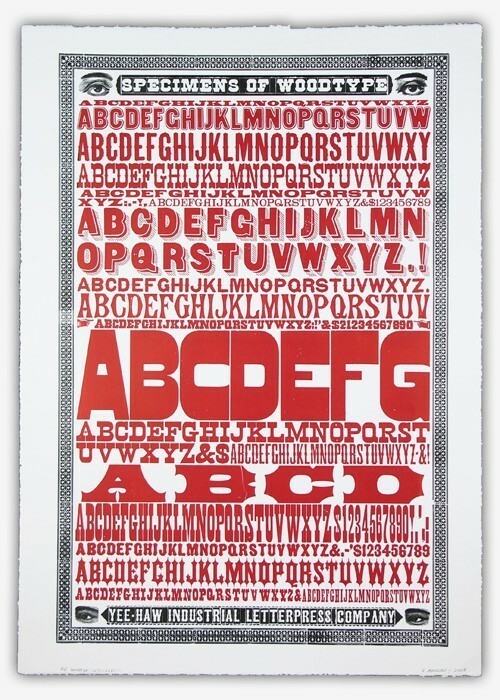 If you’re left still wanting more, try a search on Etsy for “wood type” and you’re bound to find something good. Please feel free to share any other suggestions you might have in the comments. 2 comments on Gifts ideas for woodtypers .